Goodness, over the last few weeks my time has been spent doing all Cheverly activities. We went to see DC’s #1 children’s entertainer, The Great Zucchini on Monday at Town Hall, on Tuesday night we walked to soccer practice, the kids are headed to a pumpkin patch and hayride with the CPRC group tomorrow, on Saturday we have soccer pictures and a game and on Saturday night we hope to see all our friends at the Legion for the Halloween Party! 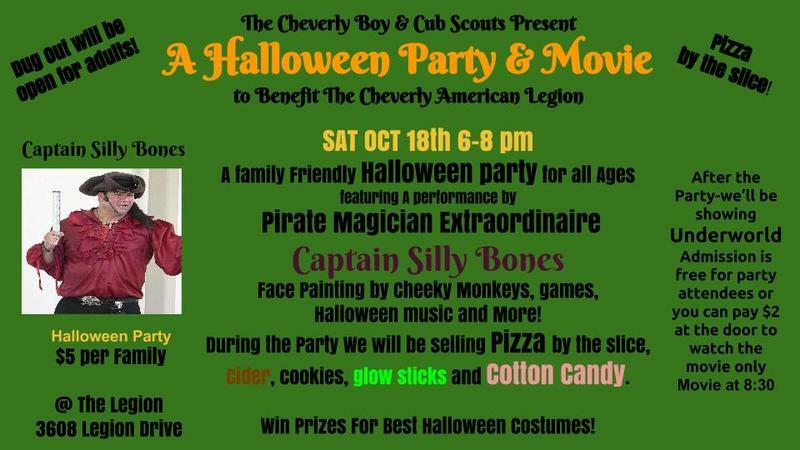 Thank you, Cheverly Boy and Cub Scouts for hosting this party to benefit Cheverly’s American Legion. These are just many more reasons why I Choose Cheverly!